For the last several years, the production of coffee has been steadily declining in Central America, and more than one factor is to blame. 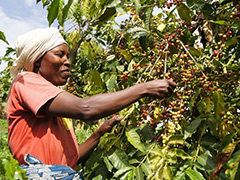 Coffee is a weather-dependent crop, which means that the variance in rainfall can take an enormous toll on the plants. Over the last six years, the fungus that causes rust has destroyed a significant number of coffee trees, and experts say that over 40% of coffee crops in Central America could soon be lost. The rust that accumulates on the leaves of coffee trees has a multifaceted effect on the plant. Ultimately, by shielding its leaves from sunlight, the fungus prevents photosynthesis, gradually weakening the plant until it dies off. Experts have pinpointed climate variation—dramatic changes in weather and rainfall in the region—as the central cause for the sudden outbreak in the destructive rust. The report put together by the U.N.’s Intergovernmental Panel on Climate Change predicted continued downpours resulting from shifts in El Nino and La Nina, meaning that the coffee-killing rust will become even worse in the near future. Potential losses to the coffee industry in Central America could have widespread economical effects, as the crop is a primary export for many countries in the region. The rust phenomenon is not without precedent. In 2008, Colombia’s coffee output was nearly cut in half, severely damaging the country’s economy. Interestingly, one proposed solution to the problem of rust is the bioengineering of new seeds that can withstand the effects of the fungus. Researchers are working diligently to create the coffee seeds of the future. While the rust fungus is caused by an abundance of moisture and rain, climate change and drought has also played a destructive role in the coffee industry in recent years. In early 2014, Brazil lost almost 20% of its coffee output to droughts while skyrocketing the cost of coffee from $1.20 per pound to about $2.20. Even coffee giant Starbucks was affected, as the company decided to absorb those costs itself, so as to not make its products more expensive for consumers. Posted on June 4th under Global Ecology.